Looks like its going to be the week of next-gen iPhone leaks. Only yesterday, images of purported iPhone 5 rear shell along with its side were leaked by at least two different sources. Today, a new blueprint has been leaked on the web (via Macotakara) which points at a larger display measuring a little over 4″ along with a new position of the FaceTime camera i.e above the earpiece instead of being next to it as found in iPhone 4 and iPhone 4S. However, the legitimacy of the schematic cannot by guaranteed at this moment. 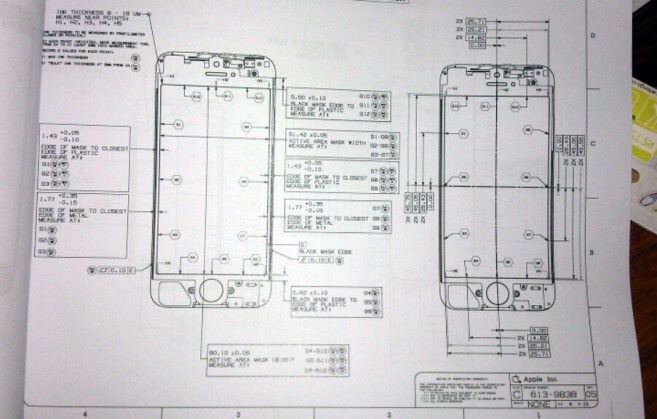 iLab Factory carries the image thought to be the plan of the back panel housing of next iPhone. It is thought with a plan for back panel housings leaked yesterday and seems to be more likely to become slightly lengthwise. Even though we cannot be certain of anything yet, but it would be pretty safe to expect that Apple’s next-gen iPhone is going to sport a larger display than previous models.